How to set alerts for leaving your navigation route?Locus	How to set alerts for leaving your navigation route? You know it, you’re riding your bike in the woods by Locus navigation and there are trees fallen on the path so you take a detour and hope that it joins the original route somewhere. Correctly set Locus lets you immediately know that you’ve left your route and starts guiding you to the nearest route point. After some time it rather recalculates the route so that you don’t get completely lost. That’s perfect but how to get this? Let’s be honest, Locus settings can be sometimes quite a riddle for someone so it’s not useless to chip in an advice or a tip. Distance for recalculation or maximum allowed deviation? These terms can be found in Locus navigation settings (menu > settings > navigation). 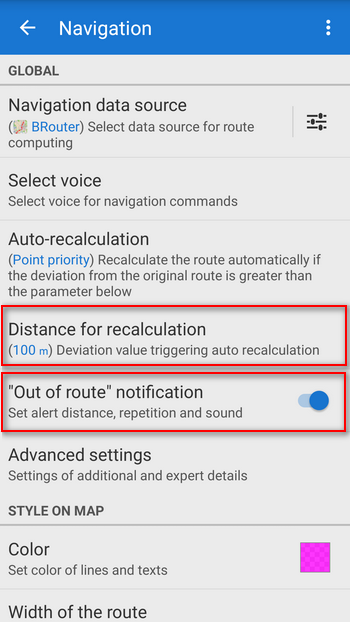 Distance for recalculation defines the spot that triggers automatic recalculation and rendering of a new route. 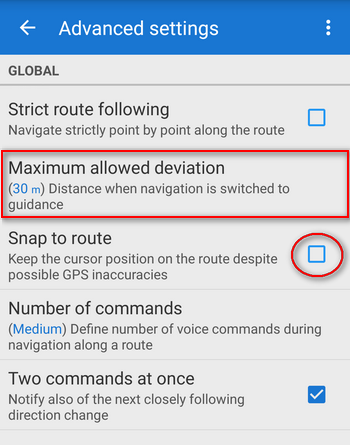 Maximum allowed deviation is a distance in which Locus switches from navigation to guidance mode – guiding to the nearest route point with a beeline. Add the “out of route notification distance” – yes, all these can be set according to your needs. All mentioned parameters are pre-set with default values. However, not everybody is happy with them. It’s good to get inspired from time to time. 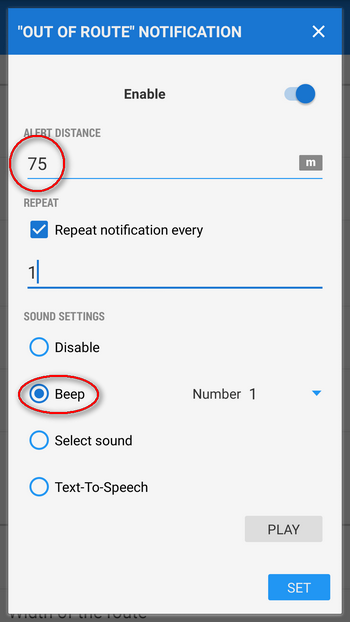 Set the distance to 75 meters, select the sound. Willy selected a simple beep in 1 second interval. It’s pretty audible during a bike ride (unlike TTS that can be appreciated during a hike). Go back to the settings menu and select “Advanced settings”. The maximum allowed deviation can be set to 30 meters. In a more rugged terrain we recommend bigger values, the GPS can be less accurate. Switch off the “snap to route” option for better illustration of the settings. So how did it go? Is your setting different? Better? Share it with us!